Here’s a little backstory on Sarah and Troy’s elopement. When we got engaged we figured planning for the next summer with school and everything else going on would be too rushed but soon realized to plan around my school schedule would mean waiting until after June 2017. We decided on September 23rd, 2017 as our wedding date (a three year engagement). The past few Christmases we had agreed to get each other nothing. I would follow the rules and he would get me something extravagant, like a horse. So after a couple years of getting him nothing and falling for his white lies I decided to get him a trip for Christmas. I booked us plane tickets and a hotel to spend some time together over my reading week in February. As the trip started approaching we began to Google what to do while in Quebec City. 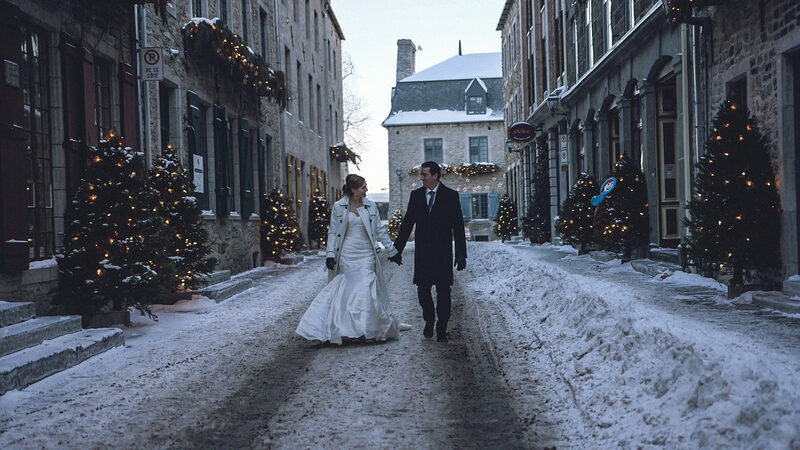 I came across the Hotel de Glace‘s website and noticed weddings at the top of the page, I clicked on it and we joked about doing it. On a whim I emailed to find out about availability and it turned out that there was. We both wanted to have a small ceremony and were considering City Hall followed by a larger reception, so eloping wasn’t too far off from what we had been thinking. We decided to go for it and surprise everyone when we return home from our trip. How cool is that? We are honored to had witnessed and captured on film Sarah and Troy’s wedding day. Check out their wedding film below.